Over 75 years of combined machining experience. We are a job shop for the metal cutting industry. Experienced with ferrous and non-ferrous material. 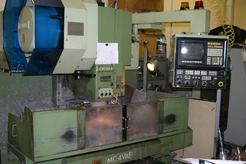 Specialize in CNC machining, manual machines for secondary operations, proto type work, plus assemblies. Programming aided with Cad / Cam assistance along with Eagues 3-D System. Production runs of any size are accepted. We can supply the material, your preferance. We have the capacity to handle your machining requirements from print to finished component. 24 Hour Emergency Service To Meet a Production Deadline or Repair Item!